It’s not often I have meetings, work events or conferences I have to attend… or at least ones where I have to dress particularly professionally. That’s one benefit to working for myself and also working in the fashion industry – people sort of expect you to just look cute. It doesn’t really matter how casual or dressy you go! On those rare occasions I do have/want to look a touch more sophisticated, I nearly always opt for a stylish shirtdress. It takes the guesswork out of getting dressed and looks instantly polished without really any effort at all. I have several in my closet at the moment, but the newest one to grace my wardrobe is this ruffle-pocket number I found at Nordstrom. Isn’t it darling?! It’s the perfect blank canvas for wearing whatever colors you want to style it with! The neutral trench color is so useful and transitions seamlessly from summer to fall and winter to spring. You can clearly wear it all summer long too! For fall, try pairing this shirtdress with cognac, forest green or burgundy accessories and shoes for a fun pop of color this coming season. If you’re more of a black addict, that’s an easy option too! I just love it. It cuts a bit shorter on me (I’m 5’9), but I’d bet it’s the perfect hem length for any of you shorter gals looking for a dress you can wear to the office. PS – I’d recommend sizing down in this dress. I’m wearing a six, but could have easily gone down to a four. 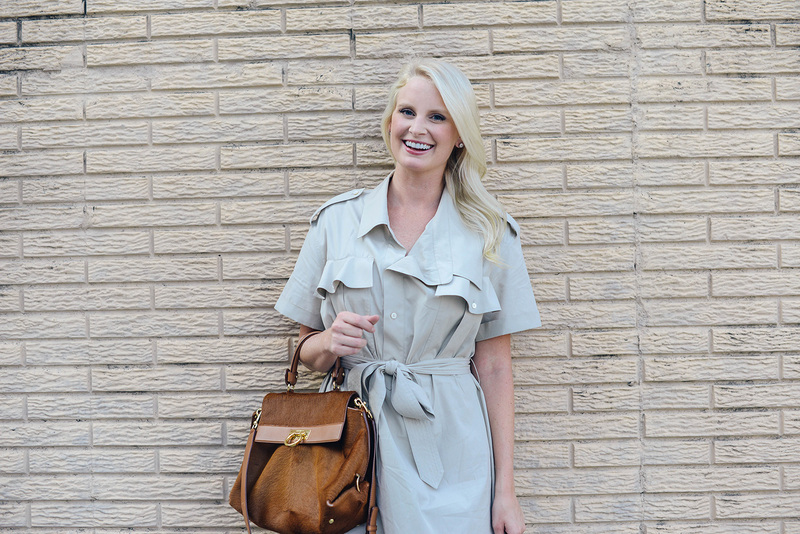 There’s a lot of wiggle room in the dress, but the trench belt really cinches you in either way! Also, when I first tried on the dress I was confused by the collar, but it’s apparently supposed to be that way haha. That’s the perfect work dress indeed. I love the look of this dress! It is like a trench dress! So chic!